Are you a retailer? Do you need EPoS cash register systems in your store? Get in touch with CCM EPoS and we will supply you with innovative cash registers designed to ease the process of orders and payments within your company. Our team at CCM EPoS have been supplying commercial businesses with bespoke cash register EPoS systems for over 20 years. With our experience, we have the knowledge to provide modern technological techniques that will simplify your point of sale processes. Do you want a quick and efficient method of taking orders? Our electronic touch screen cash register systems allow you to process orders with ease. In a busy hospitality environment, you want your transactions to be processed without a glitch. Our systems are designed to enhance the efficiency of your sales operations with clear touch screen instructions. Our TouchPoint server will include all the necessary features like voids, no sale and the option of multiple till transactions so that your business runs smoothly. Read the benefits in store when you stock our hospitality EPoS systems. By using the simple interface of our EPoS cash register systems, you will supply your business with a reliable PoS system. With our systems you will record market trends and real-time reporting so that you make the necessary changes within your business. We take pride in the retail EPoS systems we provide, so why not discover the features we install for you at CCM EPoS. At CCM EPoS, we understand that technology is always developing. We keep with the times and implement an advanced solution to EPoS strategies. 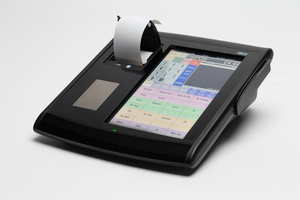 We stock portable EPoS cash register systems that are ideal for businesses within the hospitality sector. Whether you work in a restaurant, hotel or bar, the mobility of our Order Pad solutions will give you the flexibility you need to record multiple orders at a time. At CCM EPoS, it is our goal to provide EPoS cash registers to small businesses and medium businesses alike. At such great value prices, it is no surprise that we have received many clients looking to stock our innovative EPoS solutions. We understand how each commercial environment differs depending on the products they sell. When you choose CCM EPoS, we will tailor our cash register EPoS systems to your business requirements. When you need reliable and efficient EPoS cash register systems in your company, then contact the touch screen PoS systems specialists at CCM EPoS. Give us a call today on 01202 302666 or email info@ccmepos.com.